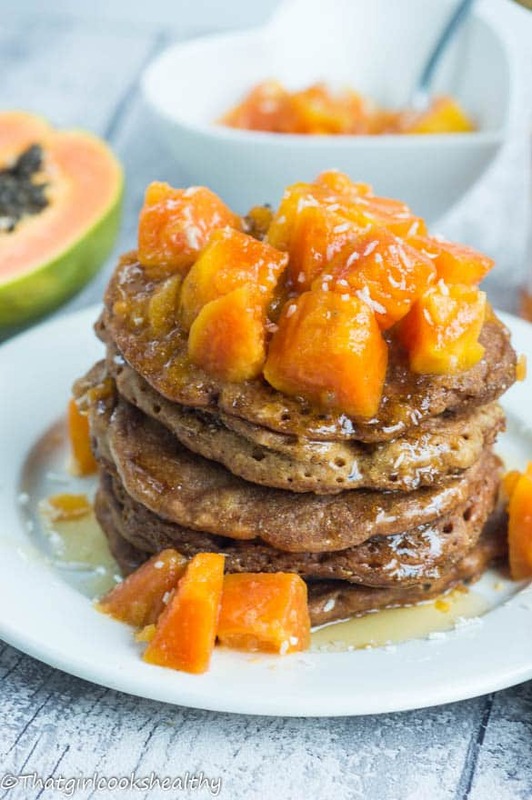 Papaya pancakes – Giving a modern day Caribbean tropical twist on pancakes made using a gluten free flour called sorghum topped with fresh papaya chunks. When I think about the word pancakes I usually have an image of the typical all around American breakfast. Caribbean people don’t generally consume pancakes for breakfast, it’s definitely more of a Western/American thing. 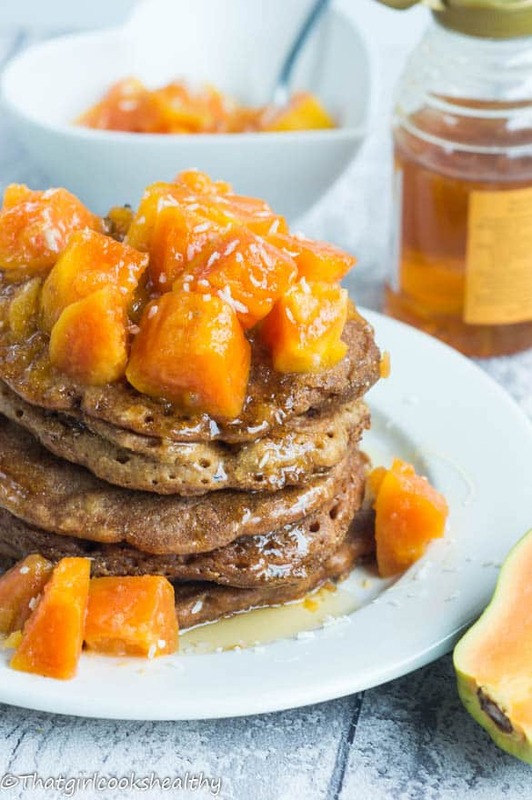 I don’t recall eating pancakes for breakfast as a young child, the social norm was either porridge, dumpling/bakes with eggs or saltfish with veggies. 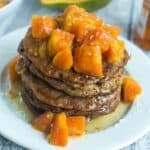 With the American diet being so influential I decided to combine a tasty Caribbean fruit with the classical American breakfast and so the papaya pancakes were born. Now the interesting about these pancakes was the choice of gluten free flour. As you’re probably already aware gluten free flour blends require lots of trial and error. Trying to find the most appropriate hybrid flour mix to bake cupcakes or Caribbean roti or a Jamaican patty isn’t easy at all. I’ve spent some much money on flour blends that most haven’t even made it on the blog. The good news is my experimenting saves you the time, effort and money, while I continue to act as the guinea pig for my readers. 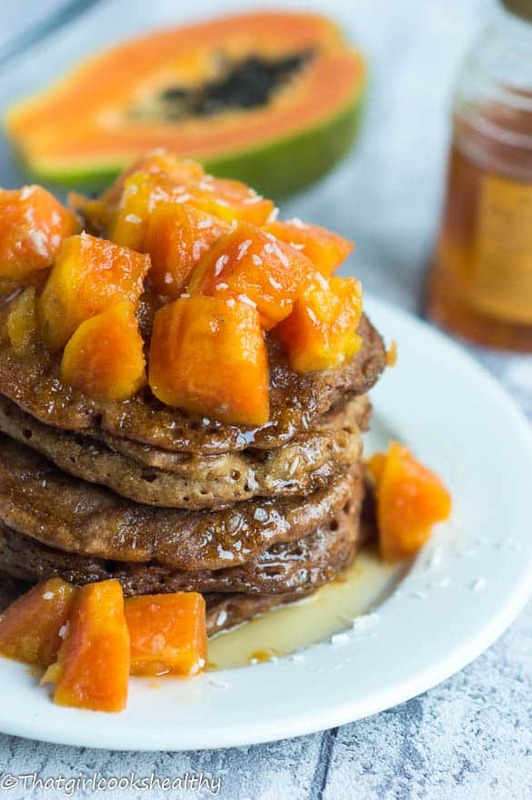 At the moment, I’m having some great results with the following flours – coconut flour, almond flour, tapioca and the latest addition being sorghum. In my opinion sorghum is the least spoken about gluten free flour, just analyse the supermarket/health store shelves to note its absence. However, if you reside in the UK you’ll find sorghum labelled in Indian supermarkets are Jowar flour. Although sorghum is a whole wheat cereal grain (with an edible hull) it’s a great alternative for a wheat free diet. It also digests at a much slower rate than processed flours, which is good news if you’re looking for a flour that won’t spike insulin/glucose levels. 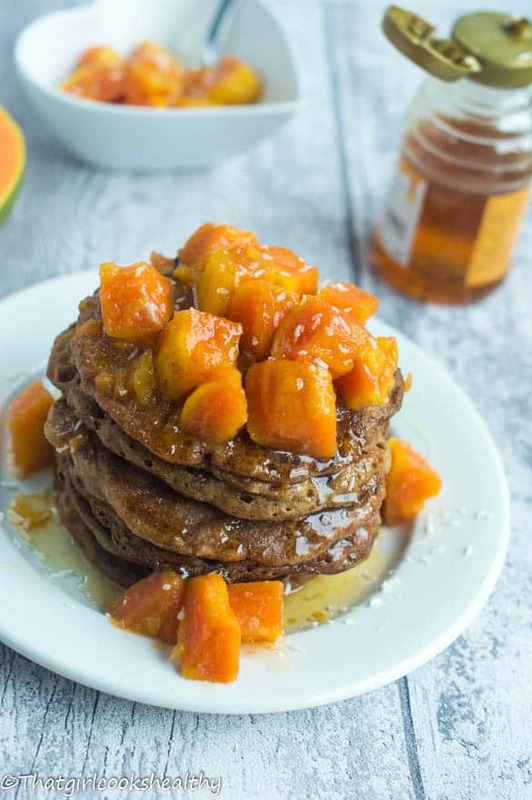 sorghum bears a neutral/light colour and sometimes sweet in taste. In my opinion do find this flour to be slightly dense with a dark hue upon cooking – refer to the pancake pictures which attest to this. If density is a concern of your’s, simply scale down the recipe by 1/3 replacing that 1/3 with a lighter flour such a tapioca starch. This is a simple recipe which won’t take you very long to make at all. 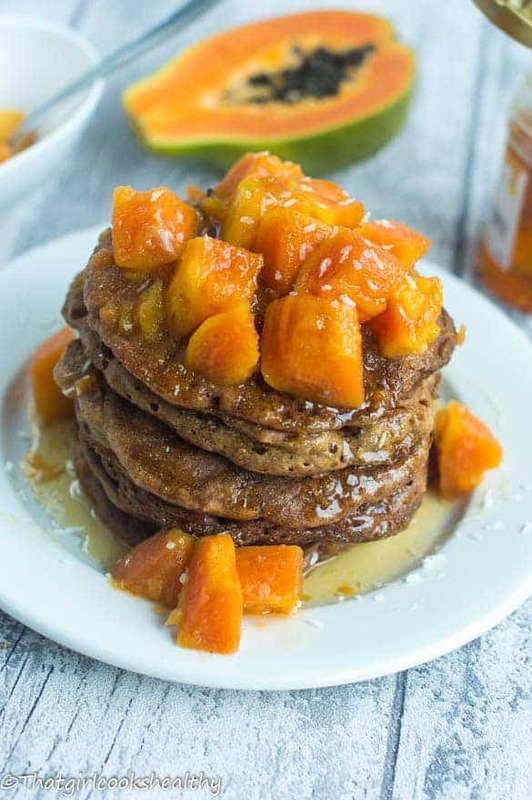 The papaya is lightly steamed in a light syrup base with a medley of tropical spices – cloves, cinnamon and nutmeg – imparts a beautiful spice note beyond the imagination. Melt the coconut oil on medium heat in a saucepan then add the coconut nectar. Mix the oil and liquid sweetener together for one minute. Temper the spices (cloves, allspice and cinnamon) in the syrup mixture for a further 30 seconds then quickly add the papaya. Coat the papaya in the syrup then pour in the warm water ready to steam. Cover the pan with the lid and steam for 5-8 minutes – the papaya should be tender to the touch. Feel free to mash some of the papaya pieces to thicken the syrup some more. To make the pancakes ,put all of the dry ingredients into a mixing bowl. In another bowl whisk the egg briskly until fluffy. Make a well into the centre of the bowl with the flours and pour in the egg followed by half of the noted coconut milk. Start whisking from the centre of the bowl, gradually drawing in the flour.and the remainder of the milk. Whisk until the batter has reached a smooth consistency (rid of any lumps). Heat a crepe or frying pan (medium heat) with a dollop of coconut oil and ladle some batter into the pan. Tilt the pan everso slightly to create an even thickness and size. Repeat step 11 and 12 adding a dollop of coconut oil each time. Once finished serve with the papaya pieces on top. Nice recipe. Love pawpaw. I’ll look out for this flour. I love paw paw too. Yes, You can purchase it online if you experience any difficulties with obtaining it. These are so different! Great recipe!